Forget Motion Detection that is old hat. Send alarm activations and alerts directly to your mobile. Our Ultra HD IP Cameras are highly intelligent and some of the best available on the market. The cameras have a range of features that are really useful to you or business by keeping you, your staff and your company, safe. Video analytics can transform standard CCTV systems into intelligent and effective detection and alert systems. CCTV technology integrated with CCTV video analytics, general recognition software systems are capable of monitoring direction, missing or abandon objects & changes in your CCTV. This feature can be used to detect item/s being removed from the image. By having this feature it means the cameras are great to be used in i.e. galleries, caravan parks etc. 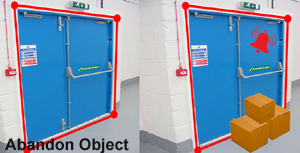 - surroundings where certain items shouldn’t be moved from the image. 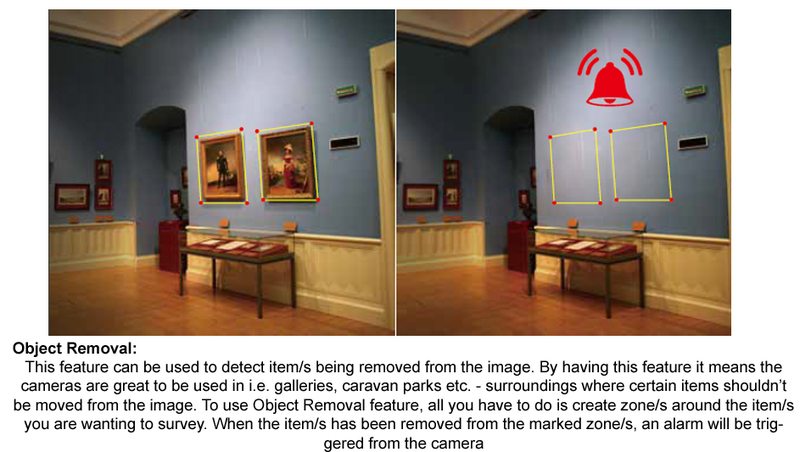 To use Object Removal feature, all you have to do is create zone/s around the item/s you are wanting to survey. When the item/s has been removed from the marked zone/s, an alarm will be triggered from the camera. This feature works in a similar way to how object removal works; you create zone/s around the area you want to observe. When the zone/s has been intruded an alarm will be triggered, this feature is great to use when a camera is covering outside fire escape doors at your business. 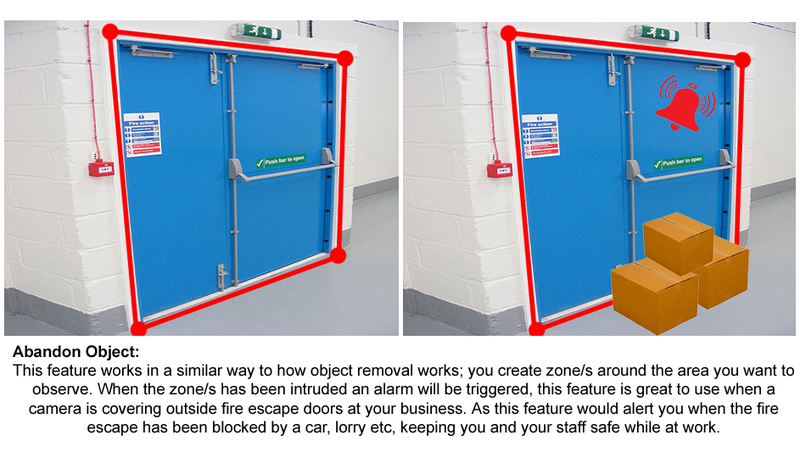 As this feature would alert you when the fire escape has been blocked by a car, lorry etc, keeping you and your staff safe while at work. This feature can detect the change of environment affected by the external factors, the blur and cast of the surveillance images and some certain actions can be taken when the alarm is triggered. 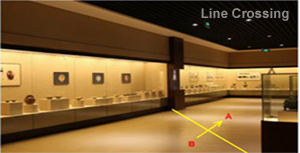 Detect the exception of the image in the whole surveillance scene, including six kinds of exception events- low light, excessive brightness, low definition, colour cast, interference and scene change. This feature is used for situations in which the camera has been unwantingly adjusted. For example: If the camera has been forced out of position, had the lens damaged or something large blocking the view. These exeptions allow you to act on any abnormalities straight away as opposed to having a camera out of action until somebody notices. This feature has the ability to trigger an alarm when someone/something crosses a visual line that you have created. 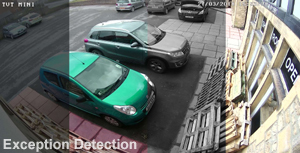 You might use this feature when having a camera looking over your office car park or factory door etc. You can use this feature so an alarm is trigger when someone/something crosses the line in a certain direction or both ways. This setting can be set for certain times, meaning if you have an office car park, you can set this feature to come on at 6pm when everyone should have left by then and come back on at 7.30am before they arrive to start work again. Knowing this you will only get notifications when no one should be there. 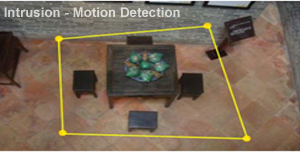 This feature is very similar to our standard motion detection but with this feature compared to our standard you can set a more specific area you want to cover. This can help you stop false alerts when motion is set off. Having a more specific area means you can select the area you want to cover without incorporating items/objects you don’t.